If the quality of your ingredients is great, your job as a cook/chef is easy. I adore leeks but really the only recipe I know and love that uses them in all their glory is Julia Child’s recipe for oven braised leeks, which takes about an hour to prepare which is way too long for a weeknight. I had one and half leeks left over from a beef braise I had made last weekend. So what to do? At our local market upstate, the freshest fish they had was Lemon Sole fillets. (What the hell is Lemon Sole anyway? There’s no fish named Lemon Sole, is there?) Anyway, it’s some sort of sole and it was fresh. And then I had my leeks. 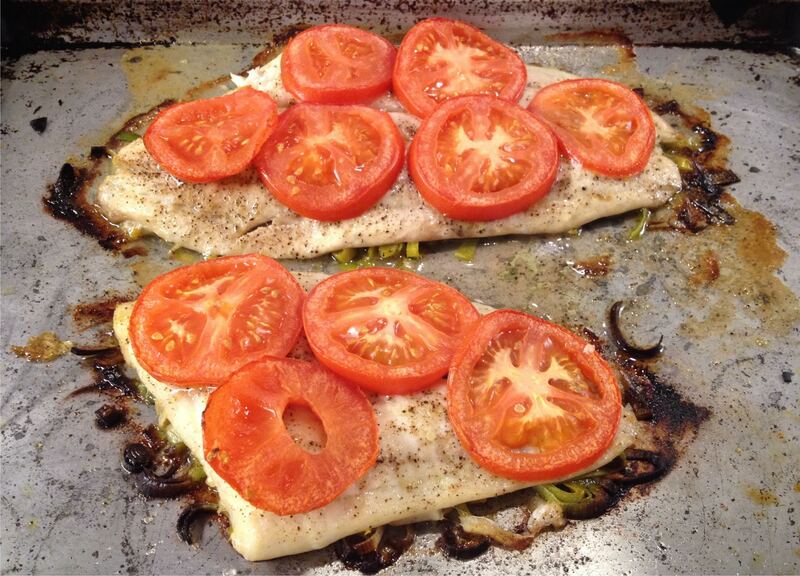 I made this Lemon Sole Roasted with Leeks and Tomatoes and it was sooo good! The leeks caramelized, the tomatoes added their lusciousness and all was so delish! I like this idea of putting things underneath the fish and then oven roasting it. Everything melds together nicely this way and I have been having fun experimenting with different vegetables. This turned out exceptionally well, this method is so easy and it elevates a simple roasted fish to extraordinary. About Lemon Sole, this is from the Harbor Fish Market in Portland, ME. This fish goes by many names, which name it gets marketed under depends on the weight of the fish. If the fish weighs under 1 lb. it is called Blackbacks or Peewees. If the fish weighs between 2 to 4 lbs. they are called Winter or Georges flounder. If they come to market weighing more then 4 lbs. it is called Lemon Sole. When we put Lemon Sole out in our retail store we always get asked the question, “Does this fish taste like lemons?” (No.) Sole is a wonderful eating fish. European chefs have had a love affair with sole, (mostly Dover) for decades. It is a flat fish and like most flat fish it’s eyes are on one side of its head, which is the dark side of the fish, it has a white underside. The designs of nature are probably some of the best; the eyes on the dark side allow the fish to hide on the ocean floor and still be able to see its prey. Slick a rimmed baking sheet with olive oil. 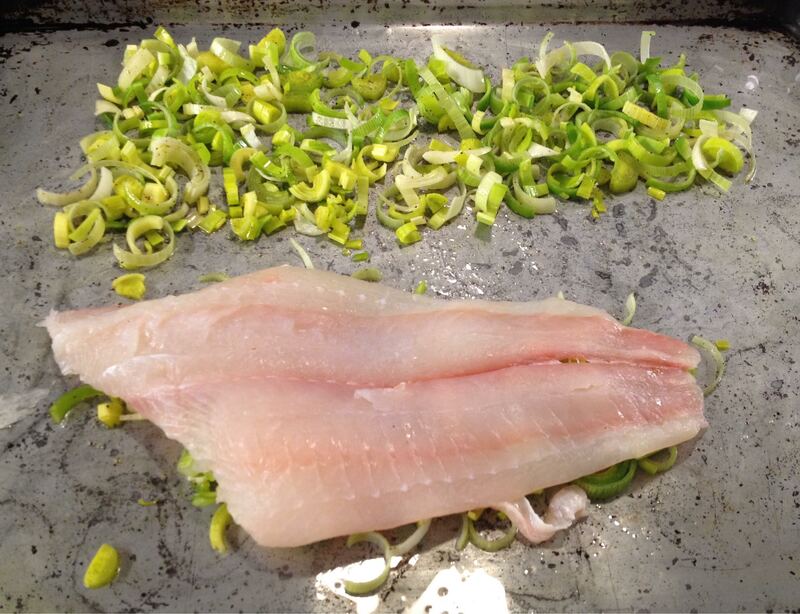 Lay out the sliced leeks in two shapes that mimic the shape of the fish fillets. Drizzle a little bit of olive oil on top of the leeks and season with salt and pepper. 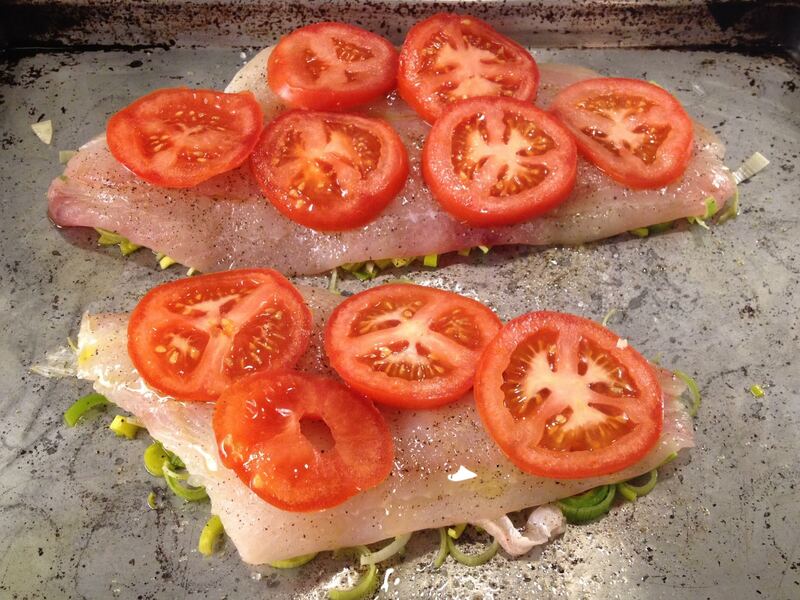 Lay the fish fillets on top of the leeks. Drizzle some olive oil on top of the fillets and use your fingertips to spread the oil around evenly on the top of the fillets. Salt and pepper the fish and lay sliced tomatoes on top to cover evenly. Roast on the top shelf in your oven for 12 – 17 minutes. Figure on 10 minutes for every 1” of thickness of your fish and vegetables. Serve with LOVE immediately – enjoy!!! So fresh, healthy and DELICIOUS! Totally Angie – and so EASY!! I love what you do with sliced tomatoes, Mary. This dish looks delicious. Thank you Jovina!! Do let me know if you try it. It is SO easy!! I hope you tried it Melissa!! A great combination!!! Thanks for sharing! With regard to a wine pairing, if you were serving the sole with a simple lemon-butter sauce, I would recommend a Pinot Grigio from Northern Italy. But for this recipe, with the leeks and tomato, I would pair it with Dry Pinot Gris from Alsace. It’s richer and rounder, making a bigger statement than its sibling from Northern Italy. Look for Alsace producers like Zind-Humbrecht, Trimbach or Beck-Hartweg. Thanks Steven – sounds perfect!! What a simple and delicious dish. I really like the addition of tomatoes here. Lovely. Yes Amanda – totally simple and super delicious. It’s all about the quality of the ingredients though. Beautiful!! I’m always trying to cook more fish and I need to add sole to my list! Yes! It’s a good thing!! Exactly Raymund!! I hope you try it. Totally Lorraine – I hope you’ll try it!! Another healthy recipe to make for John. He loves fish and tomatoes together. Win! Yes Maureen – PERFECT for John!! I learned a new tidbit of knowledge today — I had no idea lemon sole was just really big winter flounder! Fun fact. 😉 Fun recipe too — I don’t use leeks nearly enough in my kitchen. Good post — thanks. Thanks John – I learned too!! Thanks Bobbi – I do hope you try this! !